The Remington Contour MB4030 beard trimmer aims to make the trimming of your beard a smooth and simple task. Remington is one of the oldest names in hair care and personal grooming, along with Philips, Norelco, and Gillette. They use their experience and expertise again to yet again develop a personal grooming tool. How well does the Remington MB4030 actually perform? Take a look at this Remington Contour MB4030 beard trimmer review to find out. The Remington Contour MB4030 serves one purpose and it does this well – it trims hair. Using the adjustable wheel on the back of the trimmer and the two combs that are provided, you can adjust the trimmer to various lengths. There are two combs. For one to three-day beards, the shorter comb length allows a length between 0.5 to 5.5mm. The longer comb covers a range of 1.5 to 18mm. This should work for most men and most beards. The adjustable comb allows you to keep a perfectly trimmed beard without any effort. You can start with the highest setting and then work your way down. Take this trimmer with you on trips, vacation, or keep a set in your office for a quick trim. The rechargeable internal battery provides about forty minutes of continual use before needing to be recharged via the provided cable. The provided AC adapter allows you to use the device when you cannot wait for it to charge before using. When you first take the trimmer out of your package, you should charge it for 14 to 16 hours before using. A lot of guys have to deal with curly beard stubble, which can make trimming beard hair a painful task with an inferior product. This is not the case with the Remington. The slightly contoured shape of the trimmer is comfortable hold in either hand, which is a good thing when dealing with the task of trimming hair. The blades are sharp and the high-performance trimmer is able to cut hair without any pulling or pinching. Another bonus of the Remington MB4030 is the almost maintenance free design. You do not have to worry about re-oiling or sharpening your blade. This is actually one of the best features of the trimmer. Most blades wear down after a year or two. The Remington should last the life of the trimmer itself. While you should not have to deal with the blades wearing down, you will have to clean out the chamber under the blade unit. Use a small cleaning brush to clear small hairs out of the chamber after every three or four uses. The two combs are easy to clean. Simply remove the comb from the trimmer and run them under water and allow to dry before using. If you take a moment to examine the user reviews for the Remington Contour MB4030 bread trimmer online, such as Amazon, you will find that a vast majority customers were happy with the trimmer. Out of 20 reviews, 15 customers gave it a 4-star or better rating. Most users applaud how comfortable the trimmer feels in their hand and the close trim that they get. In a few of the comments, users mention that they have trouble with the ON/OFF switch and feel that the device is a little noisy. These minor gripes do not change the fact that the trimmer is able to trim beard hair without any pulling or discomfort. The only issue is that the ON/OFF switch can get stuck and is sometimes a little difficult to turn on and off. You may have to give it some additional pressure occasionally to get the trimmer to turn on or off, but this is only a minor issue and does not take away from the actually quality of the trimmer. Some people may also find the noise level too loud compared to other trimmers. It is not overwhelmingly noisy, but it does have a loud hum to it. This should not be a problem unless you are trying to use your trimmer in public. 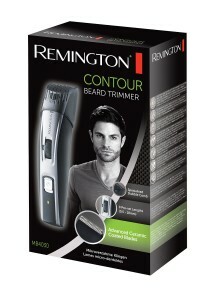 Other that minor complaint, the Remington Contour MB4030 beard trimmer is a great product at a great price point. It is more affordable than comparable models from some of the other major brands. The shape and design of the trimmer make it comfortable to use and the adjustable comb makes trimming a simple task. It comes equipped with an internal rechargeable battery, making the Remington Contour MB4030 portable. Older models and trimmers often came with various guards for trimming different lengths. Having an adjustable wheel to change the comb settings is a nice change of pace and a welcome comfort. The Remington MB4030 does what it is supposed to – keep your facial trimmed to your desired length without any mess or fuss. It is an adjustable trimmer with ceramic coated blades for a clean, precise trim every time.